North American PlayStation 2 cover art. In the years before the first Mortal Kombat tournament, Argus, king of Edenia and father of Rain, along with his wife, Delia, propose the creation of a warrior who would bring balance to the realms. In time, Delia and Argus have two children of their own, Taven and Daegon, and construct the Pyramid of Argus. Following the deception of Shujinko by the Dragon King Onaga, the warriors of all realms fight and culminate in a prophesied "Battle of Armageddon" which manifests the awakening of Blaze, the warrior created by Argus and Delia, and Taven is awakened from his slumber, compelled to seek out Blaze and destroy him in exchange for one wish as well as riches beyond belief. Taven resolves to destroy Blaze to resolve the Armageddon conflict. Ultimately, Taven, who was betrayed by his brother Daegon and the Red Dragon clan, kills his brother in revenge for the murder of his parents at Daegon's hands, but is destroyed by Blaze, who is in turn later killed by Shao Kahn. Shao Kahn then engages in a final battle with Raiden to decide the fate of Earthrealm. Mortally wounded and about to be killed, Raiden sends a message to his younger self through his amulet with the message "he must win", rewriting history. Each character possesses two fighting styles (instead of the three previously available in Deadly Alliance and Deception), one hand-to-hand and one weapon. Some of the larger bosses, like Onaga, have only one fighting style available. Other characters, such as Smoke and Mokap, do not have a weapon style, but a second unarmed style. Also new to the series is the ability to create a Fatality. These custom fatalities are a constant series of commands that players input until the Fatality ends. This method of performing Fatalities replaces the character-specific Fatalities of previous Mortal Kombat games, where gamers would simply enter one input and view the Fatality cinematically. As the player adds each input, less time is allowed for further inputs and some moves cannot be repeated. There are eleven levels that can be achieved with Kreate a Fatality, the lowest being a basic Fatality and the highest an "Ultimate Fatality". The greater the number of inputs for the Fatality, the more koins (the in-game currency) are given to the player. The Konquest mode in Armageddon is a combination of the same mode seen in Deception with elements borrowed from the spin-off adventure title Mortal Kombat: Shaolin Monks. The storyline centers on Taven and Daegon, two brothers who were put in suspended animation because their mother Delia (a sorceress) and their father Argus (the Edenian protector god) foresaw a cataclysmic event brought about by the Mortal Kombat fighters. Their awakening leads into the Konquest mode, which in turn leads into the game's standard play. Taven is the main hero that the player controls in Konquest, while Daegon, his brother, is the primary antagonist, plotting with villains such as Shinnok and the Red Dragon Clan in order to destroy both his brother and Blaze to attain full godhood for himself. Certain weapons are available at times in Konquest mode, which appear to handle very much like those found in Shaolin Monks. Various relics can be collected, one for each Kombatant (except Taven, Chameleon, the two fighters that the player can create in the PS2 version, and additionally Khameleon in the Wii version), throughout this mode. Konquest unlocks characters' alternate costumes and other rewards in the rest of the game, while successfully completing the Konquest entirely will unlock Taven for arcade play. Meat, Daegon, and Blaze can be unlocked by collecting enough relics. In addition to the choice of over 60 characters, Armageddon gives players the ability to design and use new fighters in the game. From the number of options, there are potentially thousands of different kombinations available. During production, the game offered at least 14 different character classes, which include Humans, Tarkatans, Mercenaries, Black Dragon Members, Ninjas, Retro Ninjas, etc. However, after the game's release, only one preset was available to the two genders, Sorcerer to Male, and Tarkatan to Female. Although the clothing of each class is still available, it must be individually unlocked, and cannot be preset. All these presets can be unlocked by unlocking each piece of clothing that makes up that class. The preset will then appear under the preset menu. Players can give their character a unique fighting style, by changing their stance/win pose animation and assigning different (already named) attacks to the buttons on their controller. There is a range of swords and axes (the only weapons available) and special moves to choose from. Most moves and costume items need to be purchased with Koins earned in the game's other modes, though some moves and items are available for free from the beginning. The fighters can also be given their own storyline. If a player uses their creation to finish a single player game, they will see the ending that the player designed for them, although the ending will cut off after roughly twelve lines or if the last line consists of one word. They can also be used in multiplayer games and online, using the PlayStation 2's online capability or Xbox Live, although the online service for both versions has since been terminated. The ending that the game shows is the same text that the player inputs as the fighter's biography. The minigame in Mortal Kombat: Armageddon is named "Motor Kombat". True to the name, Ed Boon compared it to Mario Kart in the September 2006 issue of Official Xbox Magazine. Each of the characters has a customized go-kart, as well as their own special moves. The Motor Kombat characters keeps their cartoonish "super deformed" style that was introduced in Deception's Puzzle Kombat mode. It also includes style-based fatalities for characters, and death traps. The cars are based on the characters' looks and personalities - for instance, Baraka's car has blades on the front bumper as an homage to Baraka's forearm blades and Scorpion's car is powered by a fire-breathing skull as an homage to his "Toasty" Fatality. Motor Kombat features online play, as well as offline support for up to four players (two players in the PS2 version) with a split-screen display. In the game, players can knock their opponents into various deathtraps on the courses, like rolling pins, stones, crushers, slippery snow caves filled with stalagmites, and endless pits. The character roster for Motor Kombat is Scorpion, Sub-Zero, Bo' Rai Cho, Jax, Baraka, Raiden, Kitana, Mileena, Cyrax and Johnny Cage. 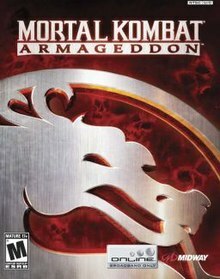 The PlayStation 2 and Xbox versions of Armageddon contain 62 fighters (as well as two extra slots for user created characters), the most of any Mortal Kombat or tournament fighter game to date. Only two characters, Daegon and Taven, are new to the series, while Sareena makes her playable debut on non-portable consoles, and Meat makes his debut as a legitimate character. The Wii version contains all the original characters from both the original versions, as well as exclusive character Khameleon from the Nintendo 64 port of Mortal Kombat Trilogy, increasing the roster to 63. Playable characters in bold are returning characters with new designs or characters entirely new to the series. The rest of the roster's character models are recycled from Deadly Alliance, Deception and Shaolin Monks. Armageddon contains every single playable-fighter from the six main fighting game installments of the franchise and their upgraded versions, not counting the adventure games like Special Forces and Shaolin Monks. Khameleon, a secret character from the Nintendo 64 version of Mortal Kombat Trilogy (not to be confused with the male Chameleon) was absent from the PlayStation 2 and Xbox version of Armageddon, but was added to the character roster of the Wii version due to fan demand. The Krypt in Armageddon features an unused concept video for Ermac's biography, which caused rumors to circulate that biographies had been created for the game but weren't included due to time constraints. However, Midway, through fansite Mortal Kombat Online, confirmed that none had been created. A month later, in a chat event held by Mortal Kombat Online, Ed Boon confirmed that biographies would be made available on the Armageddon website. Kenshi's biography was the first to be released, on December 21, 2006, and others have been made available since then. The PlayStation 2 version was released in stores on October 11, 2006 while the Xbox version was released on October 16, with a Wii version released on May 29, 2007 in North America. The Xbox version was not released in PAL territories. It was later released as part of the Mortal Kombat Kollection on September 29, 2008 for the PlayStation 2. A "Premium" edition was released in North America for the PlayStation 2, featuring the following content in a steelbook case: a 60-minute bonus DVD with a "History of Fatalities" documentary and new videos for more than 50 characters, an animation cel of the cover art autographed by creator Ed Boon, and an arcade-perfect version of Ultimate Mortal Kombat 3 included on the main disc. There are four package design variations, some exclusive to certain stores featuring different character sets or the Mortal Kombat dragon emblem. The Wii version of Armageddon has a new motion-based control system, along with compatibility with the classic and GameCube controllers. It has a new Endurance Mode, a Wii Remote Training Mode, new menu screens, and Khameleon as a playable character. However, this version does not have online features. Reception for Mortal Kombat: Armageddon has been generally favorable. The game was often praised for including a complete character roster; IGN stated that "the inclusion of 62 total warriors is a massive achievement," while Game Informer said that "nothing really comes close to what Midway has thrown together here." GameSpot praised the Konquest mode, "which was such a low point of MK: Deception, as one of the relative strengths of MK: Armageddon." Reception to the Kreate-A-Fatality feature was mixed. While GameSpot called it "a disappointing replacement to the classics," IGN noted not having set fatalities added variety to gameplay. The reception to the Kreate-A-Fighter mode was also mixed, where some noted limitations yet with others like GameSpy saying they "haven't seen a character creation tool this robust since City of Heroes." The game's engine was criticized for being built entirely upon that of the previous 3D Mortal Kombat titles. PSM went as far as saying the system was not innovative. While many of the gameplay flaws in Mortal Kombat: Deception have been fixed (lack of a wake-up game that allows 50/50 attacks upon knocking down an opponent, and the slow jumping system, which prevents players from jumping over most projectiles, infinite combos), new glitches arise with the new Air Kombat and Parry systems. Eurogamer noted that despite the large choice of characters, "much of this number is made up by the huge number of clone characters" and that "so many characters look and play alike." The game won the award for Best Fighting Game at the Spike Video Game Awards in 2006. IGN named it the Best PS2 Fighting Game. Official Xbox Magazine put Armageddon as the "Xbox Game of the Year" in a 2006 issue. Gaming Target put the game in its "52 Games We'll Still Be Playing From 2006" selection. ^ DArqueBishop (2006-09-20). "Midway Confirms Delayed Release of MK: Armageddon on Xbox". Mortal Kombat Online. Retrieved 2006-10-02. ^ a b DArqueBishop (2006-08-11). "No Xbox PAL Version of Mortal Kombat: Armageddon". Mortal Kombat Online. Retrieved 2006-10-02. ^ McDougal, Gregory (2006-11-24). "One Last Fight to The Death". The Washington Post. Retrieved 2009-11-20. ^ Jeff Haynes (2006-09-13). "Mortal Kombat: Armageddon Progress Report". IGN. Archived from the original on 2011-07-09. Retrieved 2011-08-14. ^ "Armageddon Relics". Retrieved 2009-08-25. ^ Haynes, Jeff (2006-09-23). "GC 2006: Mortal Kombat Armageddon". IGN. Retrieved 2006-10-02. ^ "TMK E3 MKA Video #11". YouTube. 2006-06-11. Retrieved 2006-10-02. ^ Haynes, Jeff (2006-09-13). "Mortal Kombat: Armageddon Progress Report, page 2". IGN. Archived from the original on 2006-10-25. Retrieved 2006-10-02. ^ "MK Fighter of the Wiik: Khameleon". IGN. 2007-05-11. Archived from the original on 2007-04-21. Retrieved 2007-10-25. ^ DArqueBishop (2006-10-16). "No Character Biographies for Mortal Kombat: Armageddon". Mortal Kombat Online. Retrieved 2007-01-17. ^ "Mortal Kombat Online Fight Night 2006". 2006-11-06. Retrieved 2006-11-16. ^ "de beste bron van informatie over mk armageddon. Deze website is te koop!". mkarmageddon.com. Archived from the original on 2011-07-22. Retrieved 2011-08-14. ^ "Midway Boards - All Bios released so far... 5/30/07". Forums.midway.com. Archived from the original on 2011-07-19. Retrieved 2011-08-14. ^ a b Haynes, Jeff (2006-10-09). "REVIEWS: Mortal Kombat: Armageddon (Xbox) "The end is here -- has the Mortal Kombat franchise survived?"". IGN. Archived from the original on 2012-03-13. Retrieved 2007-10-05. ^ Casamassina, Matt (2007-05-25). "REVIEWS: Mortal Kombat: Armageddon (Wii) "Midway brings its acclaimed fighter to Wii with new gesture controls. Is the end experience better?"". IGN. Retrieved 2007-10-05. ^ a b Kasavin, Greg (2006-10-10). "Reviews = Mortal Kombat: Armageddon (PS2)". GameSpot. Archived from the original on 2012-03-13. Retrieved 2007-10-05. ^ Gerstmann, Jeff (2007-06-05). "Reviews = Mortal Kombat: Armageddon (Wii)". GameSpot. Archived from the original on 2012-03-13. Retrieved 2007-10-05. ^ a b Reiner, Andrew. "Mortal Kombat: Armageddon (Xbox) review". Game Informer. Archived from the original on October 11, 2007. Retrieved 2007-10-05. ^ Reeves, Ben. "Mortal Kombat: Armageddon (Wii) review". Game Informer. Archived from the original on October 11, 2007. Retrieved 2007-10-05. ^ "Mortal Kombat: Armageddon (PS2)". GameTrailers. 2006-10-11. Retrieved 2007-10-05. ^ "Mortal Kombat: Armageddon (Wii)". GameTrailers. 2006-05-24. Retrieved 2007-10-05. ^ a b Albiges, Luke. "Mortal Kombat: Armageddon (PS2) review". Eurogamer. Archived from the original on 2012-03-13. Retrieved 2007-10-05. ^ "Mortal Kombat: Armageddon (Xbox) at Game Rankings". Retrieved October 5, 2007. ^ "Mortal Kombat: Armageddon (PS2) at Game Rankings". Retrieved October 5, 2007. ^ "Mortal Kombat: Armageddon (Wii) at Game Rankings". Retrieved October 5, 2007. ^ Li C. Kuo (2006-10-20). "Mortal Kombat: Armageddon (PS2) Review". GameSpy. Retrieved 2007-10-05. ^ "Oblivion naps Spike TV honors". 2006-12-09. Archived from the original on 2007-03-25. Retrieved 2006-12-09. ^ "IGN 2006 Awards". 2006-12-22. Retrieved 2006-12-22. ^ "Gaming Target: 52 Games We'll Still Be Playing From 2006". 2007-01-03. Retrieved 2007-01-03. This page was last edited on 6 April 2019, at 16:50 (UTC).